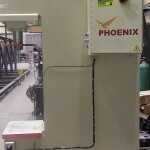 Phoenix Hydraulic Presses (PHX) recently engineered and manufactured a specialized C frame press featuring a unique dual shuttle table setup. The unique design doubles productivity by using two operators. A press operator places a part on the shuttle table and initiates the ergonomic push button which cycles the shuttle into the press. When the shuttle table is inside the press, both gates lower for safety and the press cycle is activated. After the ram presses the part and returns to its start position, the gates open and the tables switch position. On the opposite side of the press, another operator is placing a part on the other shuttle table for the next cycle. In brief, while one part is being pressed another part is being placed. 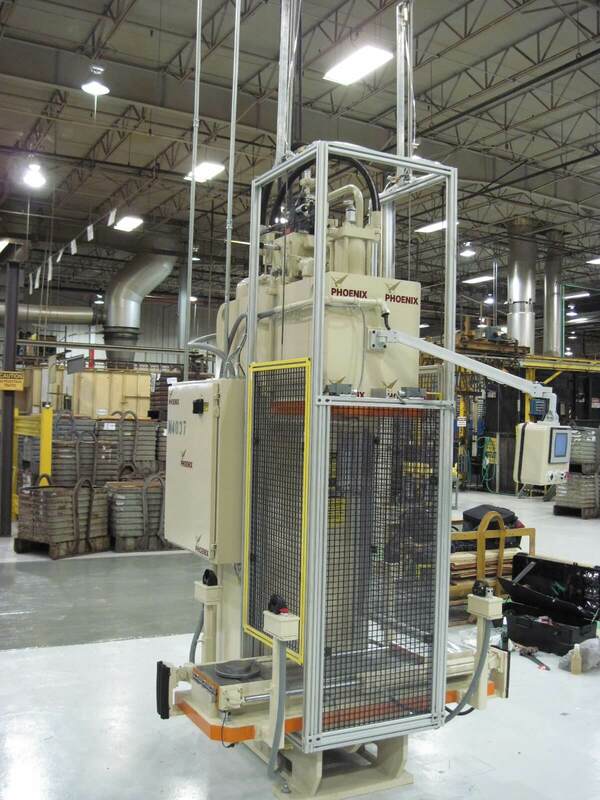 The unique speeds on this press are exceptional and include an advance speed of 266 IPM with a return speed of 254 IPM. 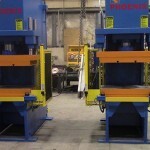 The accumulator speed is 4 inches in .5 seconds with a 15 second accumulator charge time between press cycles. Allen Bradley MicroLogix 1100 programmable controller. LVDT mounted in the cylinder for ram positioning. Centralized operator station mounted on a swing pendant. 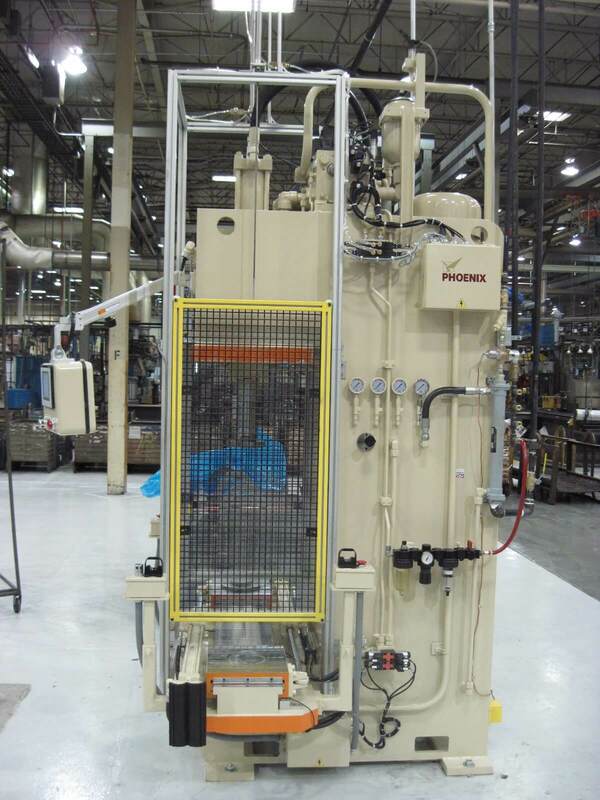 Phoenix Hydraulic Presses, Inc., is a hydraulic press manufacturer and supplier, specializing in creating efficient production solutions. 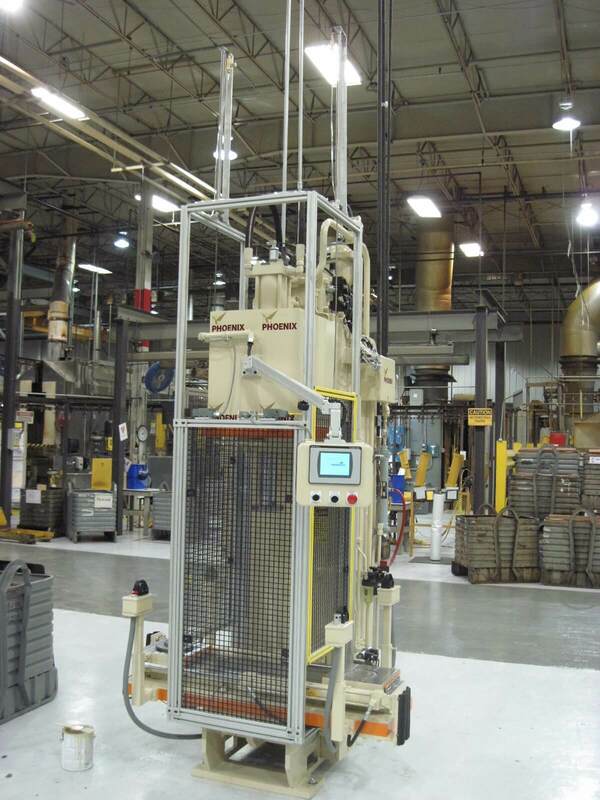 Our presses are designed with heavy duty construction, durable hydraulic components and sophisticated control systems. 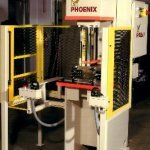 Phoenix offers the widest variety of hydraulic presses by any one company and are available in a wide range of models from standard C-Frame presses to highly engineered hydraulic presses. 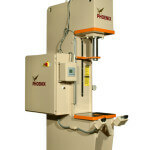 PHX presses also include a variety of tonnage of pressing force. 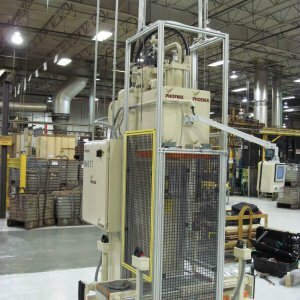 For additional information on this press or any of our hydraulic presses, contact Phoenix at (614) 850-8940 or www.phoenixhydraulic.com.